If you are looking to make a promising and long-term career in the ever changing software development industry, it is very important to know the right skills required to survive and get ahead in the modern workplace. More so, if you are looking to a make a career in programming, you need to know the right coding languages to nail it. So, what kind of programming skills do you need to survive in the extremely ever growing competent market? Thankfully, GitHub, a $2 billion start-up that allows developers to share codes and build businesses, has the answer for you. Also, called as the “Facebook for programmers,” GitHub has close to 24 million users in 200 countries who work in 337 different programming languages and also include employees working for the biggest tech giants, including Apple, Facebook and Google. 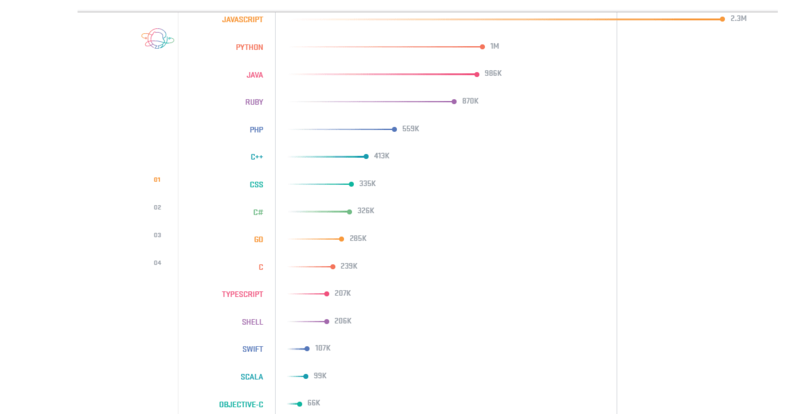 Every year, GitHub releases its “Octoverse” report that includes the most popular programming languages among users of its site, most popular topics, most trending open source projects, etc.